The tiny jungle village of Phoumi Sramol has fallen victim, they believe, to the evil hand of the demon lord Rahb. A local woman named Kanya claims her baby was snatched from her hands in the middle of the night by followers of Rahb, dressed in loin cloths, their faces painted to resemble the many-faced demon. Many of the villagers deny the temple’s relationship to the missing child. Maybe they are naive; maybe they are just fearful of the truth. If the woman is telling the truth, however, then there is much to be feared, and the story bears investigating—not just for the sake of the woman and the community, but for the sake of a world where this kind of evil can exist. This mongol-inspired module is designed for use with 0e/1e/BX and compatible retro-clones in a single edition. 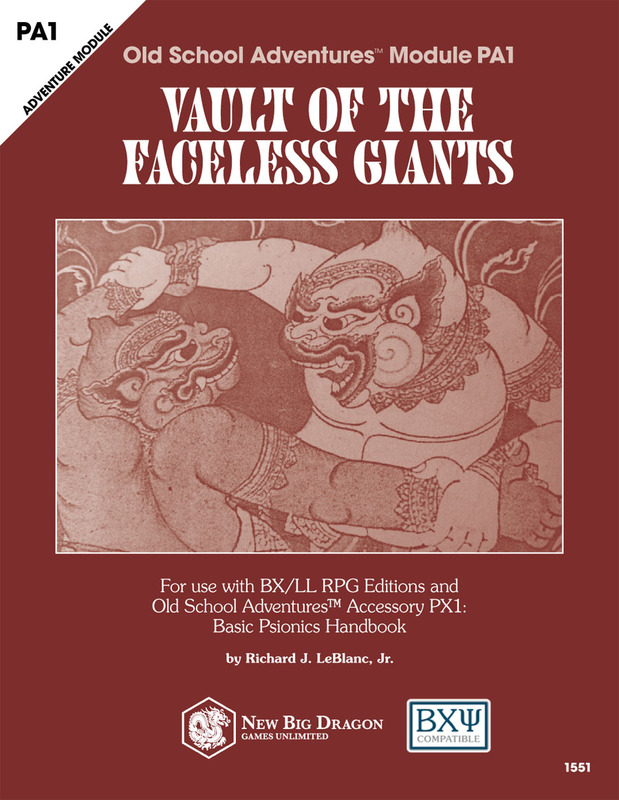 It supports sandbox style play but includes several traditionally detailed adventures. 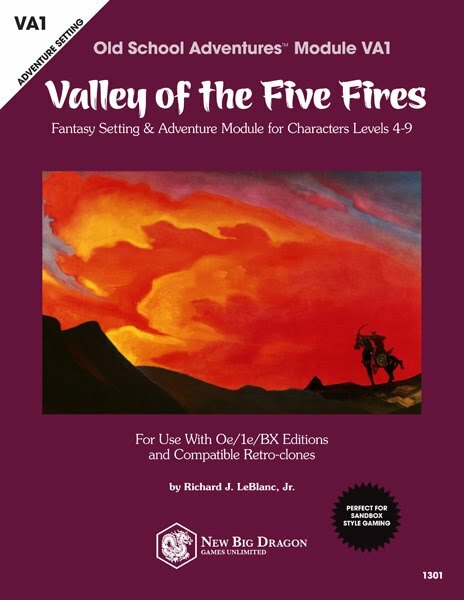 INCLUDED IN THIS MODULE: new steppe shaman class; information for new armor and weapons specific to the setting; a history of the Lands of the Five Fires and an area map; backgrounds on the hordes/tribes in the region (including detailed information for 10 major NPCs); 24 pre-generated classed NPCs; details on the settlements of Banua and Khuzu Kala; 4 new monsters and overviews for 29 others (including a 1-page "monster index" with stats for quick reference by the DM); wandering monster tables by terrain type; dozens of adventure seeds for horde-related and wilderness adventures; detailed encounters for the Quest of the Luuzhin Coins, including 9 encounter area maps and a wilderness map of the Valley of the Five Fires; detailed maps and complete encounter information for 7 minor adventures; 4 new magic items; and more! 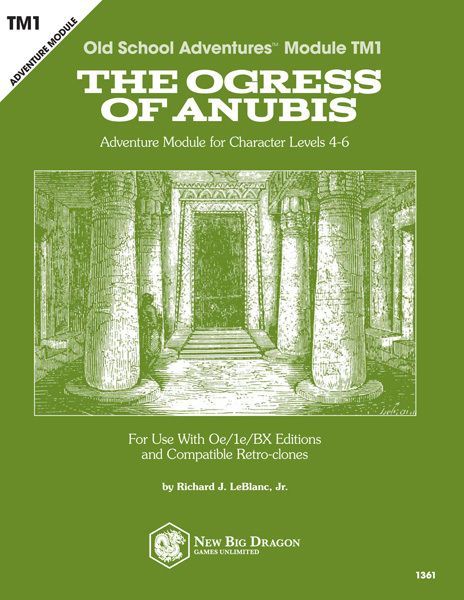 An Egyptian-themed module with a detailed adventure and sandbox support (pre-gen NPCs, new monster information, adventure seeds, and unkeyed maps). Recently, children from the villages around the temple have begun to disappear. Rumors abound that the high priestess Azeneth is sacrificing them and cannibalizing them because she believes this will make her wealthier, more powerful, and more divine. The people of the villages have begun to refer to Azeneth as the “ogress of Anubis”—believing it was Anubis himself that made this woman mad, and commanded her to consume the children she sacrifices. Someone must end this reign of fear and terror, and try to return the children alive—if it is in the will of the gods. 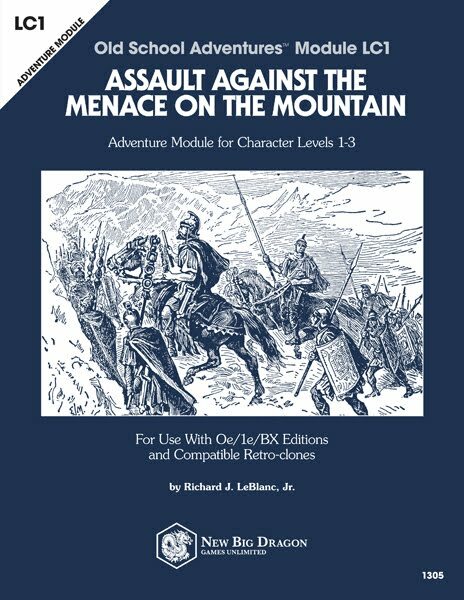 A Roman-themed module based on the story The Very Old Folk by the master of pulp horror H.P. Lovecraft; for character levels 1-3; for use with 0e/1e/BX and compatible retro-clones. "It is the Terrible Season of the autumn, and the wild people in the mountains are preparing for the frightful ceremonies which only rumour tells of in the towns. This year the dread is even greater, for the people know that the wrath of the very old folk is due upon the town of Pompelo. Three months ago, five of the little squint-eyed traders had come down from the hills, and in a market brawl three of them had been killed. The remaining two had gone back wordlessly to their mountains—and this autumn not a single villager has disappeared yet. There is menace in this immunity, for it is not like the very old folk to spare their victims at the Sabbath. It is too good to be normal, and the villagers are afraid. A cohort has been assembled to end this menace once and for all, and there is room among the throng for more heroes, including you!" 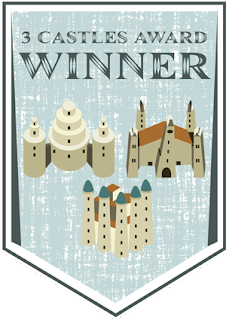 A map lined with an archaic alphabet, the promise of great treasure, and a challenge issued directly from the gods. It's enough to make any individual leave their everyday life to heed the call of adventure and pursue dreams of greatness. 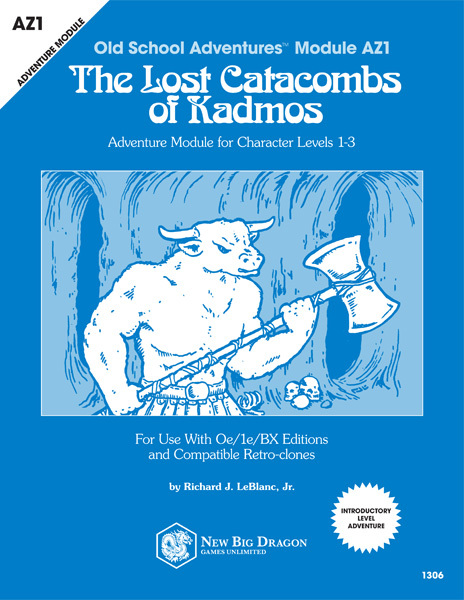 The Lost Catacombs of Kadmos is an introductory adventure for characters of levels 1-3, designed to challenge the players' thinking as much as it is their characters' physical capabilities. Something sinister is afoot in Fairmoor. A strange mist is descending upon Lightwick Haven and stealing away into the night with the young and innocent women of the village. Rumors are beginning to circulate that an ancient cult, thought to have been long absent, has returned with its sights set upon the destruction of the world. This strange force, whatever it is, must be stopped, and an end put to the nightmarish reign. 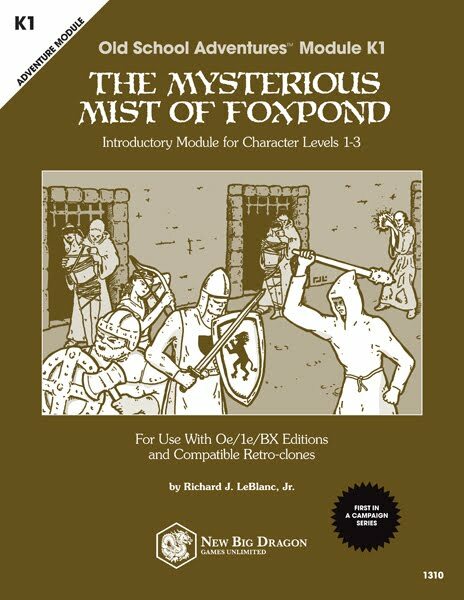 The Mysterious Mist of Foxpond has been designed as a looser "sandbox-styled" adventure centered around the small community of Lightwick Haven, with seeds leading to several adventures contained within the module, as well as future titles in the SK module series.